Question: Could you tell me if there is a quick ferry from Boston to Nantucket? Dee's Reply: Hello, Carol - No, I'm sorry to tell you there is no ferry (fast or slow) from Boston to Nantucket. CapeAir airlines has regularly scheduled flights from Boston's Logan International Airport to the island of Nantucket. Flying is not the least expensive mode of transportation, but it's certainly the fastest. It's about a 45-minute flight. I just took a quick look, and Priceline is showing current fares at $358 per person, round trip. There's regularly scheduled bus service from Boston to Cape Cod daily, year round. In season (Memorial Day to Labor Day), there's also a weekend passenger train that runs between Boston and Cape Cod. If you take the bus or the train into Hyannis, that'll bring you to Hyannis Transportation Center. 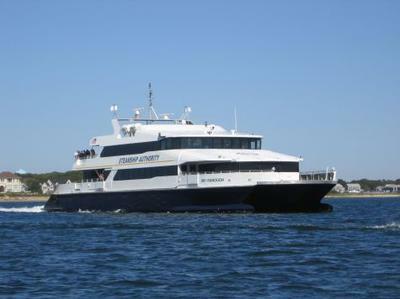 From there it's only a short walk, cab ride or shuttle ride to Hyannis Harbor where you board the ferries to Nantucket. Normally I'd say that it doesn't make much sense to rent a car just to drive to the Cape to catch a ferry. But, depending on how many people will be traveling with you, it actually might be less expensive to rent a car and drive, rather than pay multiple air, bus or train fares. I recently saw that Budget Car Rental is offering a deal to save on a one-way rental . You won't want to pay to have the car sitting idle in a parking lot in Hyannis while you're on the island. So you'd have to do a one-way rental in each direction. Pick up the car in Boston, and return it when you get to Hyannis. Then do the reverse for your return trip to Boston. Who knows? A rental car might end up being a cost-effective transportation solution for you. Check with Budget to find out! The only other option I can think of is hiring a limousine or shuttle service. One company that seems to have reasonable rates is Cape Car and Limo. Note: I've never used their services, so I can't vouch for this company personally. Give yourself plenty of time to make your travel connections. And be prepared in case something unexpected causes you to miss a connection! What's the most common cause of flight delays going to and from Nantucket? Fog! Nantucket is nicknamed The Grey Lady. That nickname comes from the island's appearance when it's surrounded by thick, gray fog ... which it often is, especially in the summer months. Although "Fog Happens" (that's a popular saying on Nantucket!) any time of day, it's most prevalent in the early morning, and from late afternoon into the evening hours. If you're planning to fly to/from Nantucket, your best bet is to schedule your flights for mid-day, if at all possible. That's when you'll have the least change of fog delays. Fog isn't much of a problem for ferry travel. The ferries are equipped with an array of electronics that allow them cruise through the "pea soup" safely and get to their destination on time. With the ferries, the issue is rough seas. It doesn't happen very often, but when the wind is howling and the seas are unusually rough, ferry service between Cape Cod and the islands might be delayed or cancelled. That's when it's good to have an alternate plan in mind, just on the off-chance you're stuck in Hyannis or on Nantucket for an overnight. I hope this information is helpful for you. If you have more questions, please feel free to ask!